Star Trek: Asterisk "Wolf In the Fold"
Scotty stands accused of the murders of at least three different women who wall died mysteriously in the same manner as Jack the Ripper's M.O. What we didn't see happen in this episode is Scotty receiving a bump to the head that ended up being the fault of some female officer. 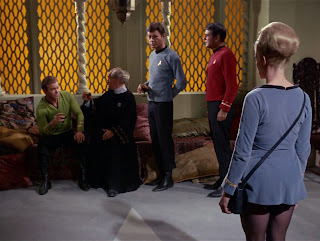 Bones seems to be worried that this incident would give him a resentment toward women in general, so he prescribes some shore leave on a planet full of loose women. Honestly, I think it was just a ploy by Bones to go there himself. It doesn't take long for Scotty to find the woman he wants to spend the night with, so he picks her up and leaves. After a few minutes a scream is heard, Kirk, Bones and Spock run out to see what was the matter and find the woman dead with 12 stab wounds and Scotty in the corner holding a knife. The evidence stacked up against him, Scotty is forced to stand trial for the murder. But not before the city Prefect's wife uses her psychic powers to see what really went down. Obviously, however, Kirk and Bones would prefer to use the technology they have on the ship to get to the bottom of the mystery. Behold, Lt. Tracy, wielder of the technology! At the same time, the Prefect's wife puts together a seance and then asks for the murder weapon so she can get some psychic readings off of that. That's when they discover the weapon is gone. The lights suddenly turn out and A SCREAM RINGS OUT! Lt. Tracy is now dead, apparently by the hand of Scotty, who is unconscious. When he wakes up, he is just as surprised as everyone else. Now it's time to really get down to business. They have the murder weapon, they have a seance set up. Time to read some minds. The Prefect's wife has everyone sit around in a circle while she calls on the help of psychic energy around the room. She says some weird stuff and some unrecognizable names. It's all a bunch of spooky mumbo-jumbo and it only gets worse when the lights turn off again! The Prefect's wife this time cries out and when the lights turn back on, Scotty is behind her. She falls forward and there is a knife in her back. This time, Scotty was not unconscious. Although, with her husband around, he wasn't going to admit to his true state of mind. All the while, Mr. Hengist, heretofore known as Piglet, objects to the proceedings and demands that Scotty be brought to justice. So with Scotty in a technical state of arrest, they all go back up to the Enterprise to access the ship's computer in the investigation because Scotty clearly couldn't have done it. A more mild mannered engineer one could never find! When they get to the ship, they find a couple of things. The murder weapon was from Rigel IV, and one of the names the prefect's wife said was synonymous with Jack the Ripper. Kirk suggests that perhaps Jack the Ripper was actually an entity that traveled from man to man and fed on the fear of others. He also suggests that Piglet, being from Rigel IV, is the one who brought both the knife... And Jack. Just then the lights in the ship go out. Piglet drops to the floor and the Jack the Ripper entity takes over the ship. In order to keep everyone calm, Bones concocts a tranquilizer for everyone to take. So while Jack wreaks havoc with the ship's systems everyone is basically entertained and not the least bit frightened. They ride that high even through Jack messing with the life support systems. But then Spock gives the computer the command to compute Pi to the last digit, and Jack is locked out because apparently the ship's computer can't handle multiple processes. Jack finally gets out of the computer, but then goes back into Piglet's body. Realizing that Piglet has actually been dead this entire time, only kept alive by Jack, Kirk orders Piglet, and Jack along with him, to be transported out into space at maximum dispersion. In this way, Jack is now just floating out in space as a disassembled body of particles. Well, now the entire crew is high on Bones's tranquilizer, so there's not much left to do, but go on shore leave. And they all lived happily ever after and learned a valuable lesson about English history. This is a good one. I love how they explain the Jack the Ripper case in this way. Jack the Ripper also makes a brief, but memorable appearance in Greg Cox's book, The Eugenics Wars part 2, and it would not have been so memorable if it weren't for the great work the writers here did of setting up his mythology. I can't say for sure that Jack never shows up again because there are some episodes of Deep Space Nine that I haven't seen, but if he ever does I won't complain.